FORGET ABOUT WORLD Cups, Champions Leagues, glorious beards and owning your own vineyard. You know you’ve truly made it as a global icon when they start to name sandwiches after you. Despite the fact that he appears to be playing at about 20% of his potential, Andrea Pirlo is taking New York by storm since joining the MLS. Now the good people at No. 7 Sub have developed a sandwich in his honour. So what’s in The Pirlo? 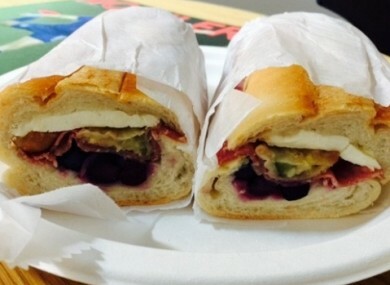 It’s salami, fried courgette, mozzarella, and pickled blueberries, all served on Italian bread (obviously). And it appears that it’s tasty too with MLSSoccer.com writer Greg Lalas giving it ”3.5 Pirlo beards out of 5″ following a taste test. It has to be said, they’ve missed a trick by not including a handful of chips down the middle. Email “Fancy a Pirlo for lunch? This sandwich has been created in honour of the bearded one”. Feedback on “Fancy a Pirlo for lunch? This sandwich has been created in honour of the bearded one”.